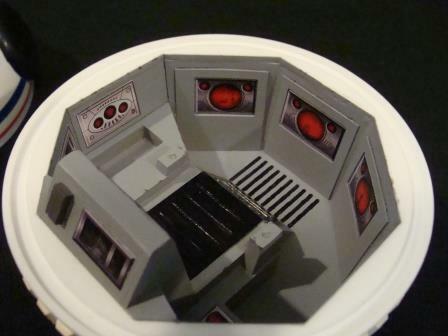 These floor lights will help your ground crew see what they're doing while preparing your ships for battle! Includes decals for customizable options. Note: If you wanted to install real LEDs inside, there is sufficient room to drill out space for them. 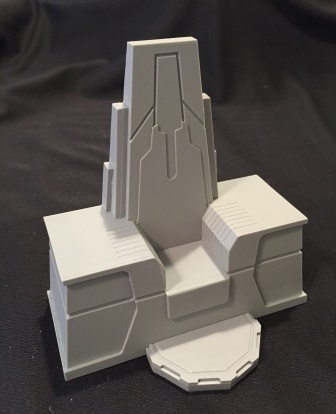 Each measures 1" by 1.75"
These solid cast resin chairs are perfect for your 3 3/4" diorama. Unpainted. Available individually or in sets of 8. 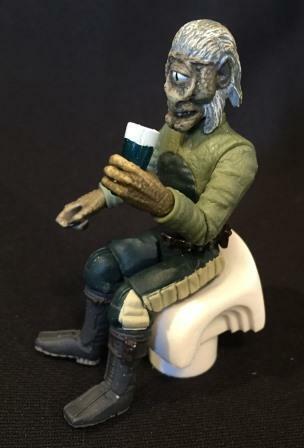 Click here to find Cantina Chairs in 6" scale! 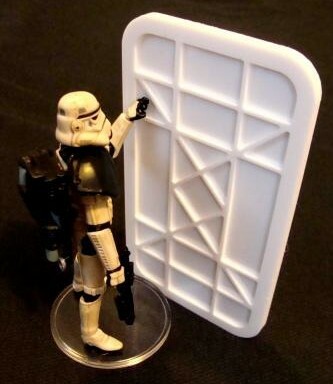 Need a heavy duty looking door for your 3 3/4" action figure diorama? Well this is the perfect thing. If you intend to place it on a wall where both sides can be seen, I'd recommend getting two of them and mount one to each side of the wall. 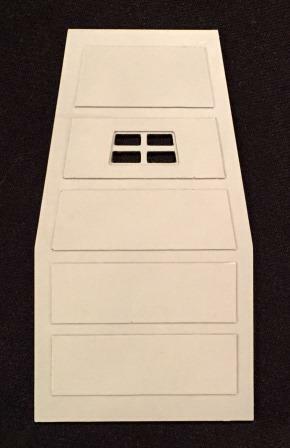 Comes unpainted and includes decal for door switch and warning sign. The spaceport door does not have a frame. 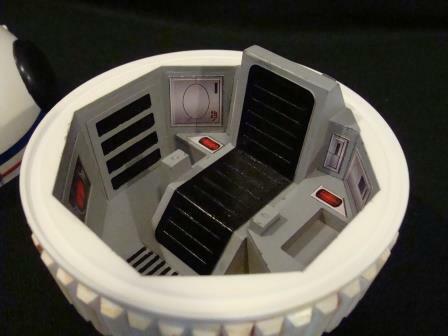 It can be placed inside a wall, or on the outside like a hatch. Loose, it could simulate a door that's been blown off its hinges. 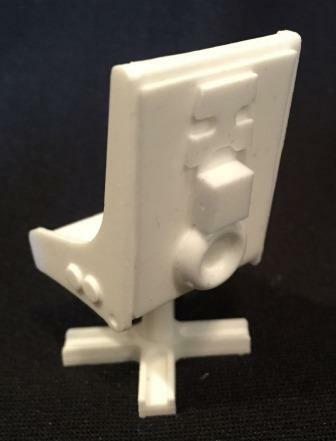 If you intend to place it on a wall where both sides can be seen, I'd recommend getting two of them and mount one to each side of the wall or together. 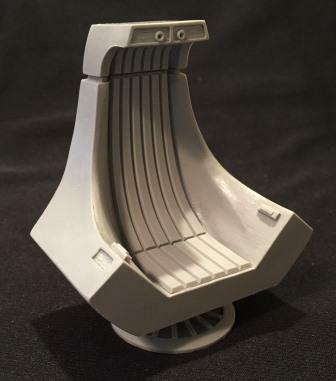 Comes unpainted. 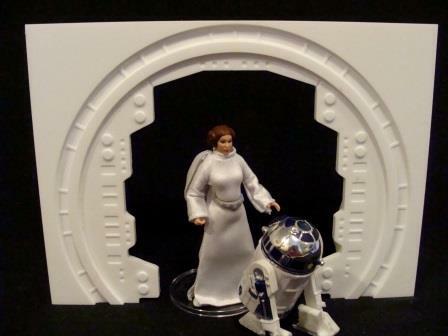 Click here to find the spaceport door in 6" figure scale! 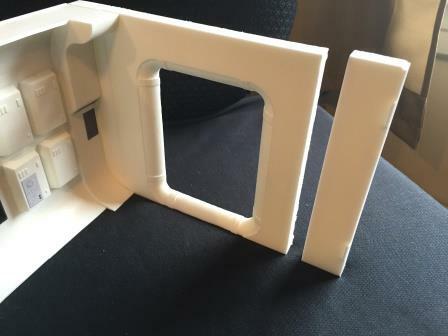 Module design allows you to mount (glue) up to 8 panels into the base. 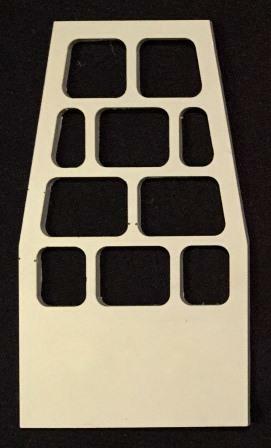 A decal set and instructions are provided. 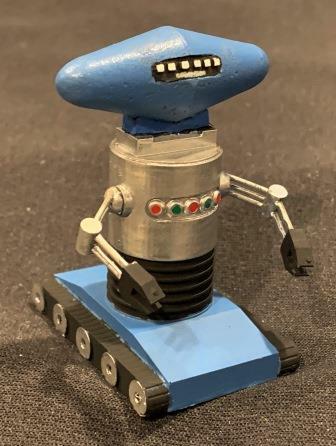 Not every robot's owner is a nice one, so you better do your job well. If you have the wrong kind of master, you may find yourself disintegrated on a cruel device like the torture rack! 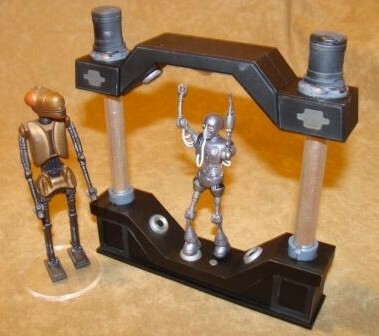 For when you don't want those pesky robots sneaking into your bar. Measures 1.375" wide by 2.125" high. Includes two decals. 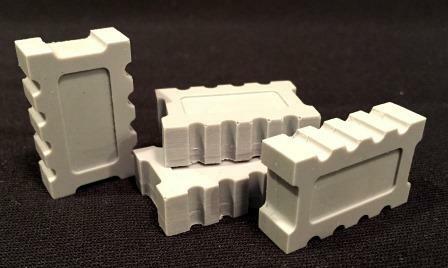 Set of 4 crates. Measure approximately .75" on sides. Need some troops moved around? Maybe cargo? Then this is the perfect vehicle for you! 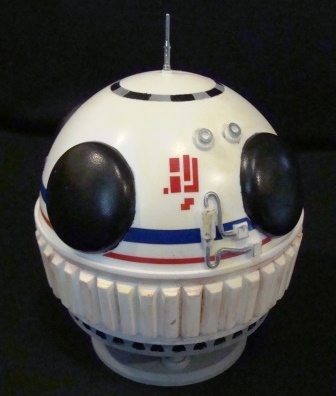 Measuring approximately 4 by 7 inches, this kit comes in four unpainted resin pieces, an antennae, and decal sheet. 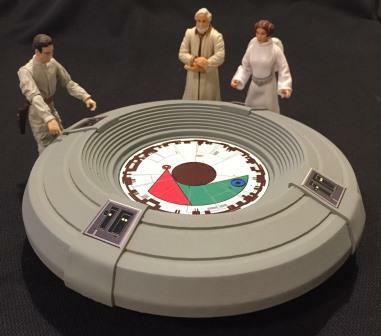 It can hold 3 to 4 figures (sitting). Remove the rear bench seat and there's room for more figures or cargo. Tons of options. Load it up with troops, robots, or even some of our cube crates! 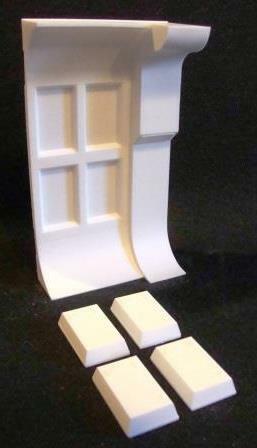 This kit comes in four unpainted pieces. 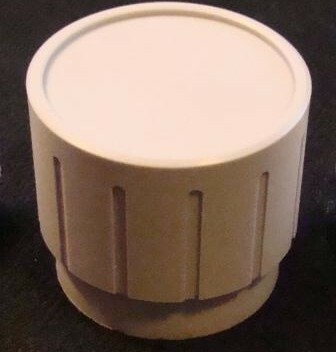 A top and bottom in cast resin and two aluminum "pistons" that glue into place. 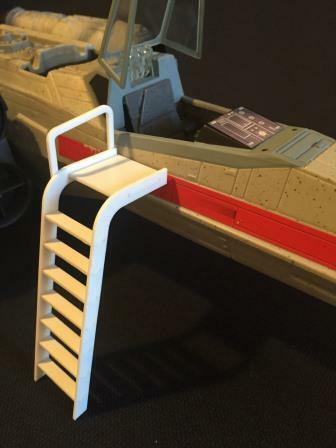 When assembled, it measures approximately 6" wide by 6" tall. 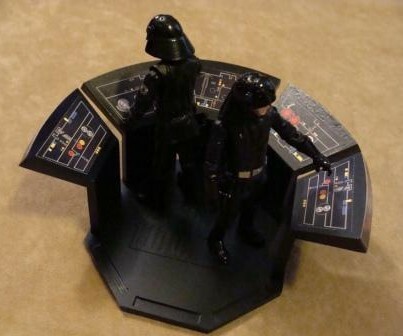 This diorama piece was not made to fit a specific action figure, so you will have to decide how best to display it. You may have to modify a figure for best results. 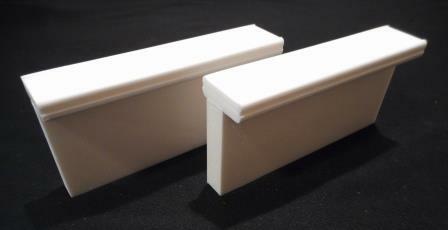 K Rails or Jersey Barriers, are the name for the sectional concrete dividers used on highways, to block roads, etc. Use as a barrier to guard against unwanted assault from vehicles. 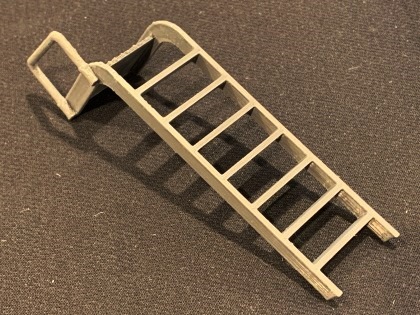 Each measures about 4" long by 2" tall. 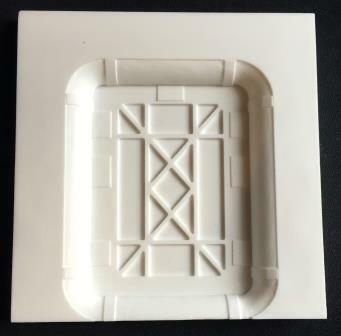 These plates are used to prevent losing footing in muddy, wet, and other slick environments. Raised areas have gritty texture detail. 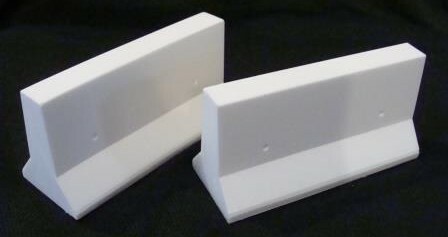 Plates measure roughly 1 3/8" by 2 3/4". These beefy computer consoles have engraved detail on front and sides. Choose between a monitor offset to the left or right. 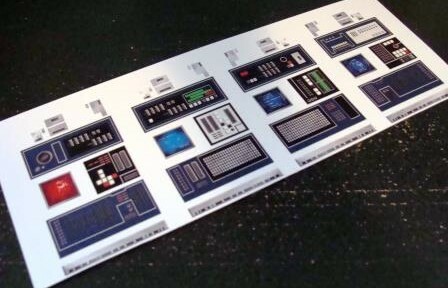 Includes decals for 4 different consoles so you can mix and match for tons of options! 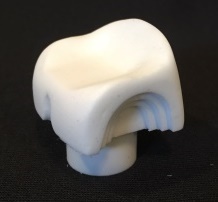 Measures 2.25" wide x 2" deep x 4.75" tall. 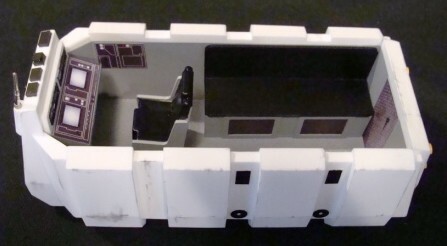 This five piece kit allows you to hold a boxy robot and flip it upside down. 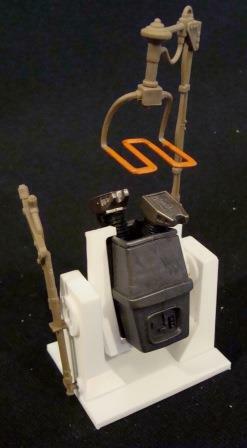 With very slight modifications you can add onto it with existing figure accessories (not sold with kit). Please contact us if you are unsure that it will work with your figures. Includes assembly instructions. We have 3 different styles of free standing wall panels available. They can be coupled together to any length and order you wish. 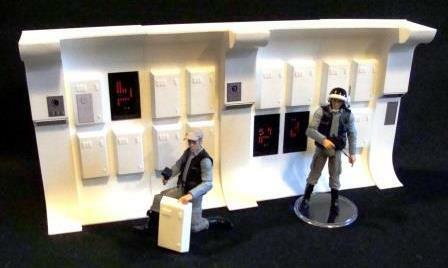 Each panel comes with a set of "boxes" for the wall. You can choose however many boxes you wish to attach to the wall. 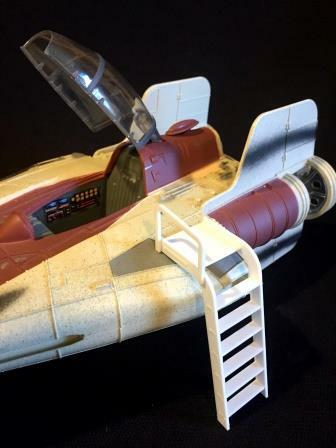 Decals are provided for detail in the recessed areas. 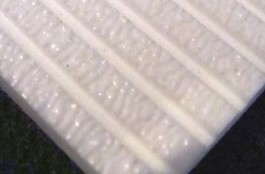 The side-column panels measure approximately 5.5" high by 3.25" wide and the center-column panel 5.5" high by 5.5" wide. 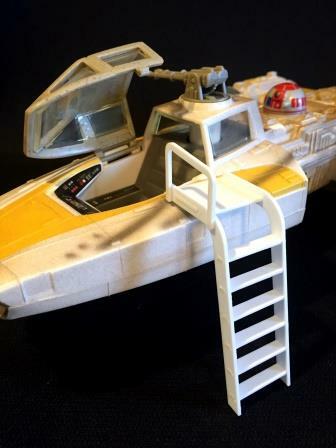 Decals included. Get things powered up with some generators. Whether at home or at the spaceport. 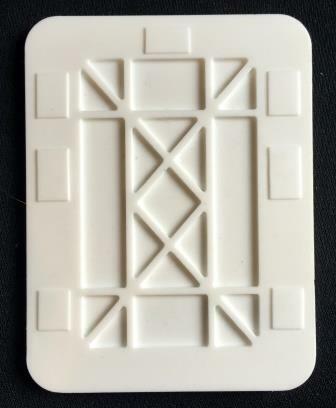 Each measures 2" across (minus detailing). Cast in white. Pictured painted to show detail. 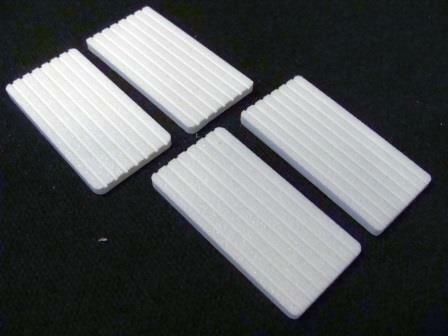 These solid cast resin tables are perfect for your 3 3/4" diorama. Unpainted. Available individually or in sets of 4. 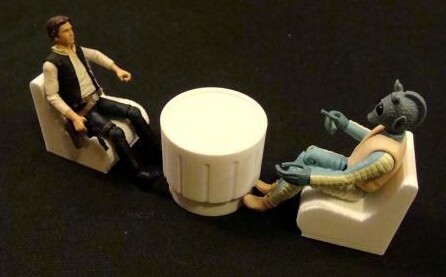 Click here to find Cantina Tables in 6" scale! 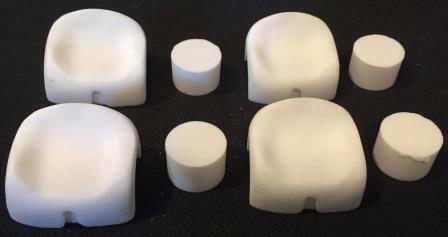 These solid cast resin stools come in 2 pieces. Available individually or in sets of 4. 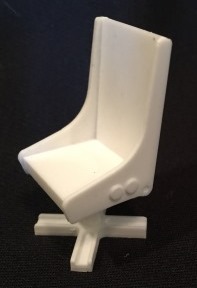 These resin cast chairs come in 3 pieces. Available individually or in sets of 4. 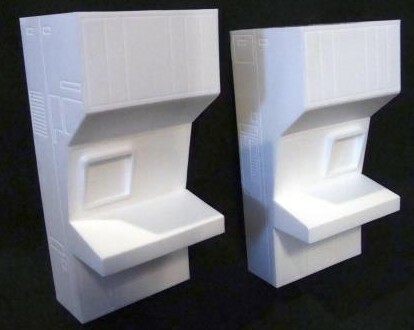 The Starship Doorway is the same width as the Starship (center column) wall. 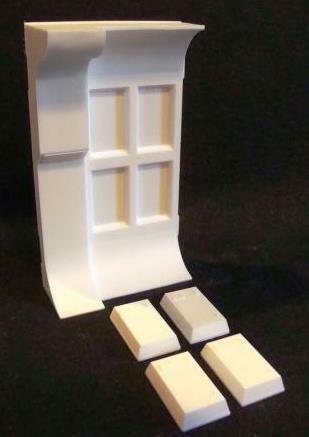 The doorway comes with decals. 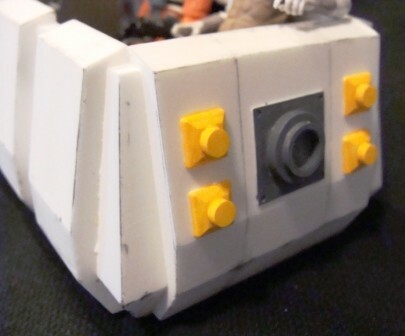 The Starship door is made to fit on the doorway. It does not rest on the same level so it must be glued into place. If you want to use the doorway at the end of a corridor, it would make the corridor narrow, so for a wider corridor, we have wall extensions. This construct can be used for almost anything. (perhaps a stadium for a flea circus!) 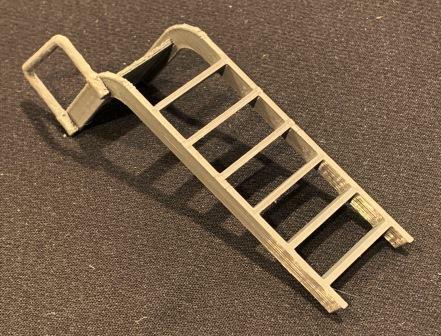 Unlike our other kits that are resin cast, this item includes two pieces of cut PVC tube and a series of precision cut interlocking plastic parts. 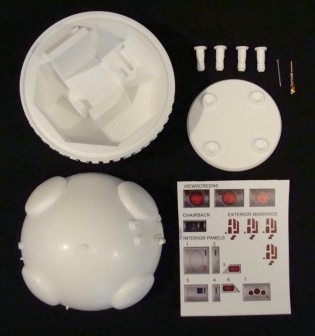 The assembled part is 4.5" diameter and 1.5" tall. This archway matches the height of our other wall panels and 7.5" wide. 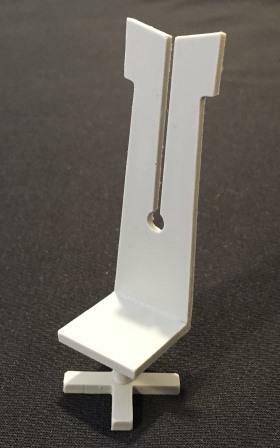 It is 1/4" thick and not free standing. 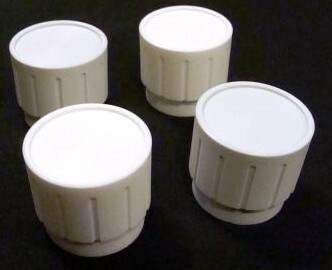 Set of 4. Measure 1.25"x.75"x.375. Is it a stove? Is it a steam powered robot? Who knows? Who cares?! He's cool. 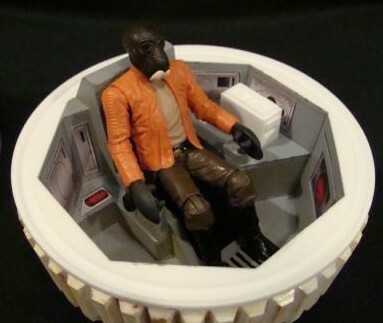 This little guy comes in two unpainted pieces. Figures to either side shown for scale. Yep, this is a thing. 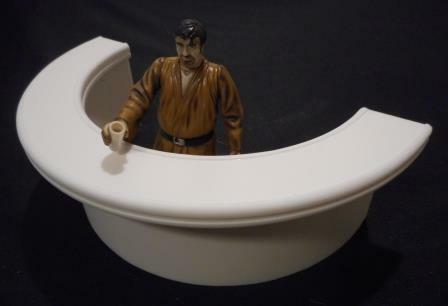 Measures approximately 6" high. 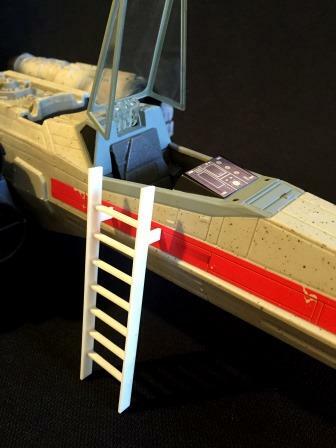 Our selection of ladders are designed for use with a variety of space craft though they may work for other vehicles or diorama applications as well. 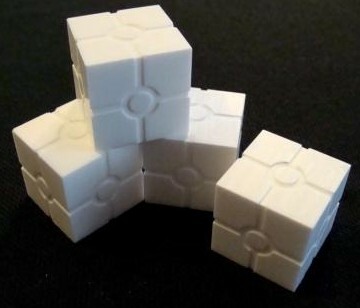 Each design comes as a series of precision cut styrene pieces that interlock and glue together. Use the pull down menu to select "Style" then change quantity in the cart. The ultimate command center. 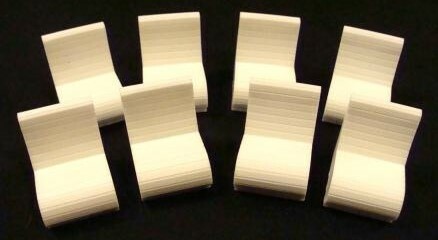 Eight wedge shaped consoles make up a half circle. Comes with decals and extra detail bits. A little bit too "ultimate" for you and need a little less? Then you can purchase just 4 consoles from either the left or right sides. For when you just really need a roving light bulb patrolling your homestead. 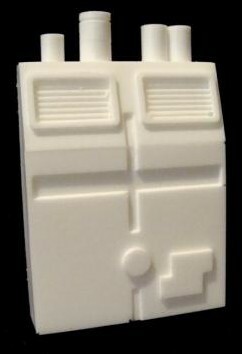 This little guy comes in two or three unpainted pieces and is approximately the same size as the Stove-Bot. Two different versions are available. The standard version or with a separately clear cast bulb. 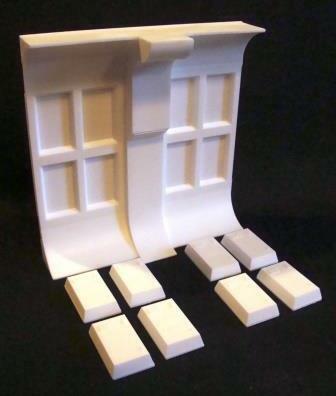 This kit comes in four pieces. 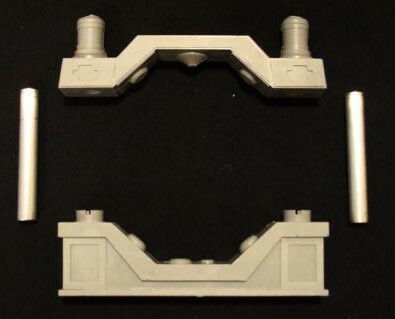 The arms are partially metal and come pre-assembled as shown. Additional robot figure shown for scale. 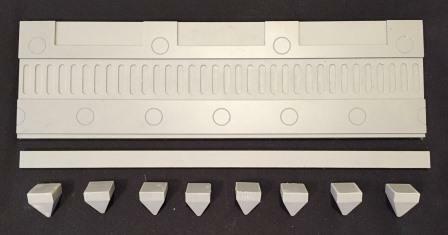 This large kit measures 11 inches long and comes with 26 pieces! 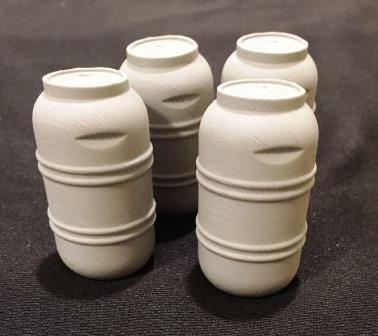 Due to complexity and customizing purposes, there is no piping included to connect or suspend the various containers. 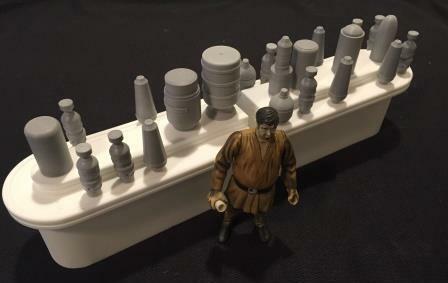 For those needing with smaller dioramas in mind, you can purchase one half of the kit. Which side will be random. Monitor the status of the battle! 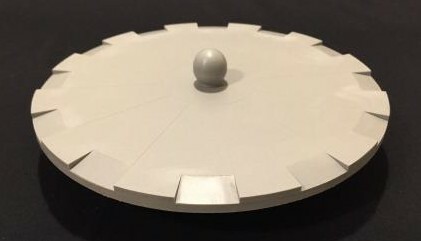 This war table measures 7" across. 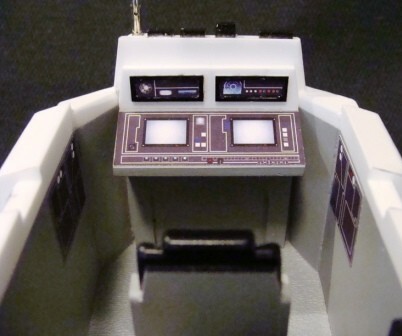 Comes in two pieces and includes decals for center display and 4 control panels. Designed to work with the shape of the distillery, you can get a half round counter or two straight sections. You will want to get two sets of the straights to go the full length of the distillery. 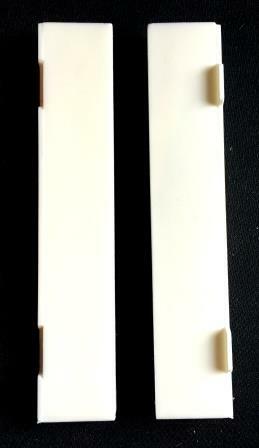 The counters come in two pieces consisting of the base and counter top. 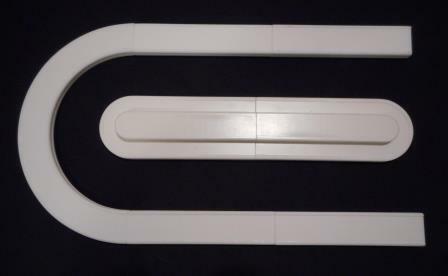 The curve measures almost 8" across and the straights are 5" long. 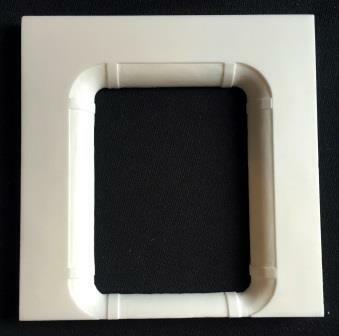 Measures 2.375" x 4.25" and features a small window. 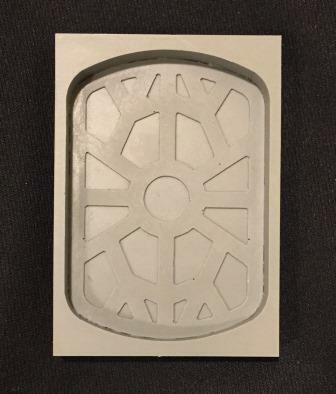 Measures 2.375" x 4.25" and features grating. For when you need to keep the really big monsters separate from the food...err...I mean people. Measures approximately 12" wide and 3.5" high (not including spikes). 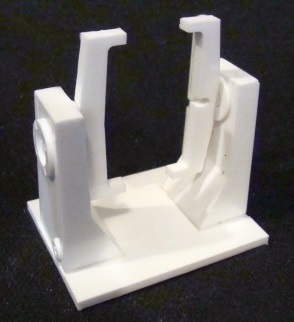 Designed to simulate a raised (open) position. 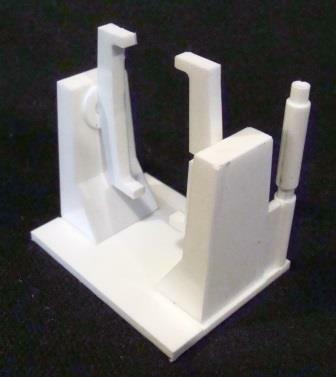 This three piece kit measures approximately 3.25" wide, 3.75" tall. 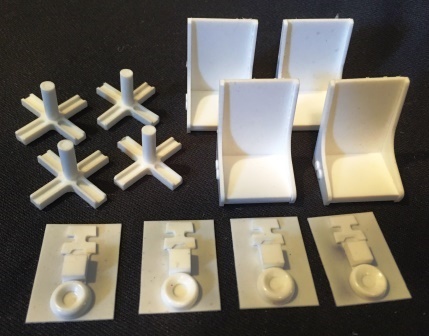 This kit comes in fthree pieces. Measures approximately 2.25" high. 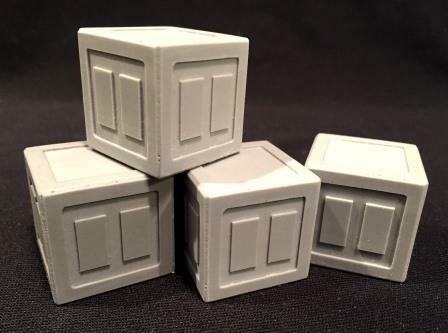 Click here to find Cube Crates, Ridged Boxes, and Ammo Crates in 6" figure scale. 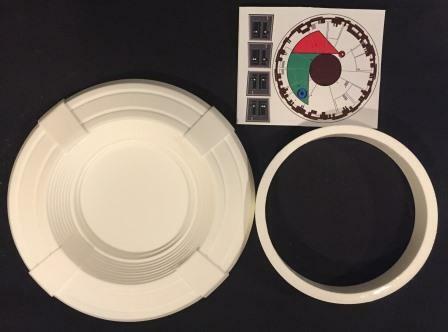 This three piece kit measures a whopping 10" in diameter with seating for 12. Includes decals. Set of 4. 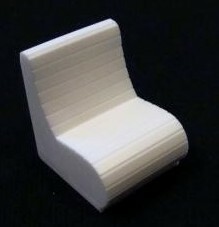 Measure just over 1" x 2"
Each chair comes in two pieces. Chose either standard or "boss chair". 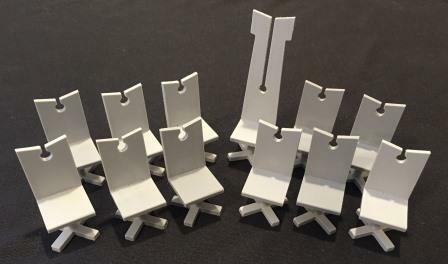 Get 11 chairs plus 1 "boss chair" for a complete set of chairs to compliment the conference table. 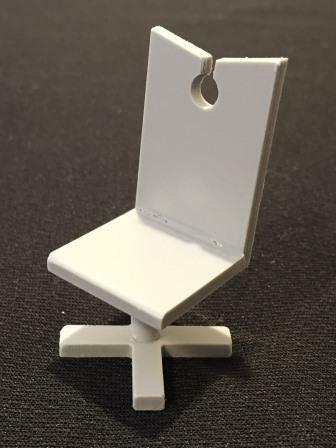 Find individual chairs below. Each chair comes in two pieces. 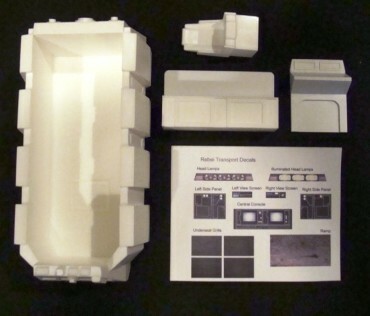 All our diorama pieces come in kit form, meaning they are unassembled or painted. 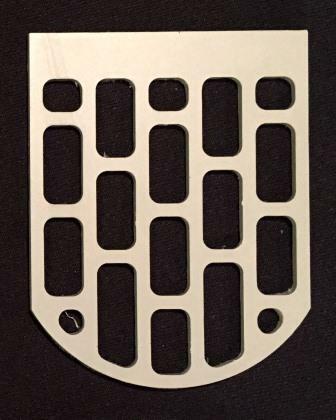 Some also come with a decal sheet. 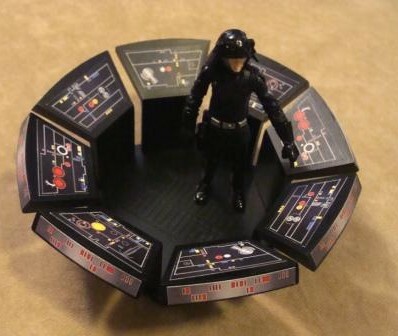 Fear not if this is your first time putting a kit together. They are not overly difficult and part of the fun is in the building! 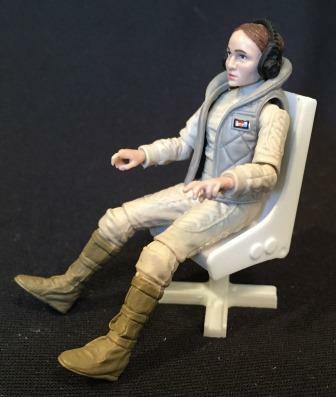 Figures shown are for example and demonstration purposes only and are the trademarks of their respective owners. They are not included with the products. 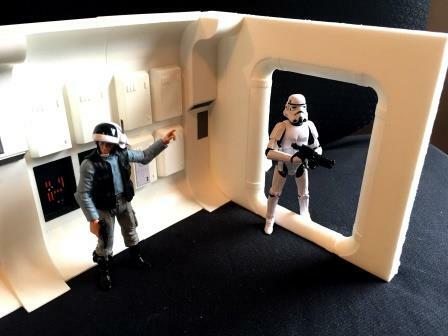 This page is contains diorama parts and kits for 3.75" action figures. 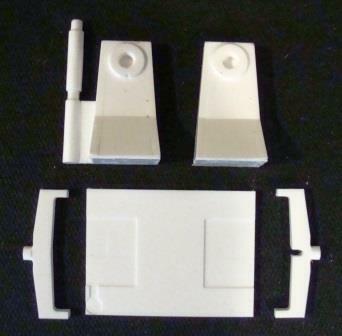 Parts for 6" figures and other scales can be found here.